Pumpkin fruit dip is a luscious dip to enjoy at any party with fruit, graham crackers, and more! It’s not too sweet so you can dip away to your heart’s content. While everyone else might be planning their big bird for Thanksgiving, I’m just over here planning what we’re going to have for Snacksgiving. What, you don’t have Snacksgiving? Thanksgiving always starts pretty early, especially if you have kids. By the time the Macy’s parade starts up they’ve already had breakfast, and halfway through they’re wondering when they can start in on the turkey and Maple Pecan Pie. Because we tend to not have the big dinner until, well, dinnertime, keeping everyone’s tummy grumbles at bay for hours requires having snacks on hand. Our snacks are usually simple things like platters of fresh veg with roasted red pepper and caramelized onion dip, different kinds of cheeses, and cured meats. This isn’t too different from what I had growing up — cheddar or swiss, summer sausage, and veggie with dill dip. Midwestern entertaining at its finest! My kids don’t eat very many raw vegetables though, so in order to get them to not go overboard on carbs or meat I offer up a bowl of fruit dip and their favorite fruits. My peanut butter fruit dip is always a hit, but when the holidays roll around I want to serve up something a little more seasonal. 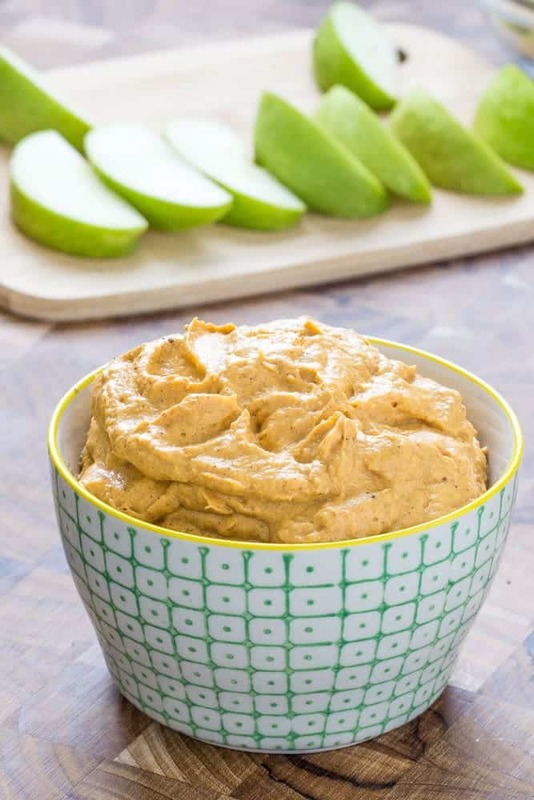 Enter pumpkin fruit dip. 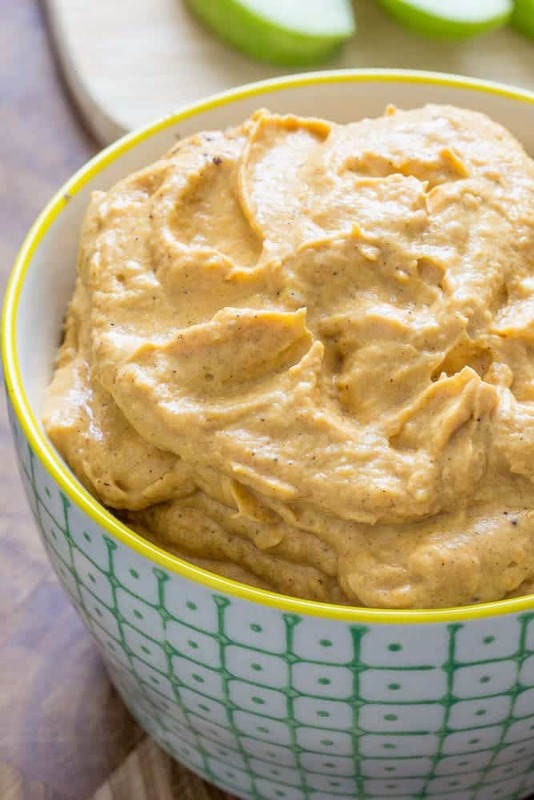 If you love pumpkin pie, this is a dip for you. With minimal ingredients, it comes together quickly — even the kids could do it! Other pumpkin fruit dip recipes I’ve seen call for quite a lot of sugar. In my opinion, that’s no longer pumpkin dip, it’s sugar dip. When you’re using sweet apples and strawberries for dippers, who needs that added sugar? I use just a bit of maple syrup for sweetness and flavor, but otherwise the pumpkin really shines through in this. You can always add more maple (or more spices) to your tastes, if you prefer. Wondering what to serve with pumpkin dip? 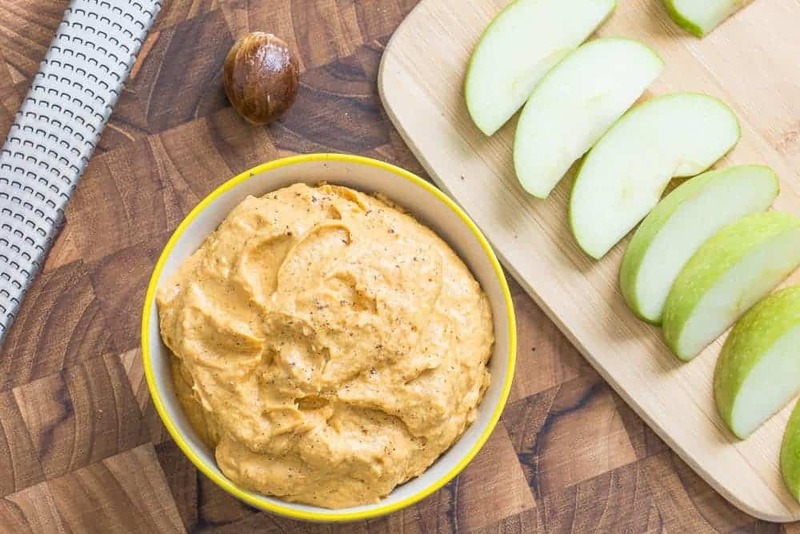 As the name implies, I love serving pumpkin fruit dip with — you guessed it — fruit! Sliced apples and fresh strawberries are always a big hit with my kids. Sliced pears would also be delicious. But feel free to get creative with your dippers, especially if you aren’t using pumpkin fruit dip as a trick to get more fruit into your kids. You could serve this pumpkin dip recipe with graham crackers, gingersnap cookies, toasted pound cake, or even marshmallows. Want more pumpkin eats this weekend? Try my pumpkin pancakes or slow cooker pumpkin French toast. They’re great for Thanksgiving morning or the day after Thanksgiving! Pumpkin fruit dip is a luscious dip to enjoy at any party with fruit, graham crackers, and more! It's not too sweet so you can dip away to your heart's content. 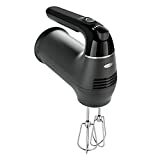 Combine all ingredients in a large bowl and blend with a hand mixer until smooth. 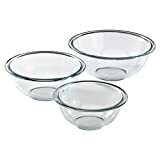 Serve with your favorite fruits, graham crackers, or cookies.